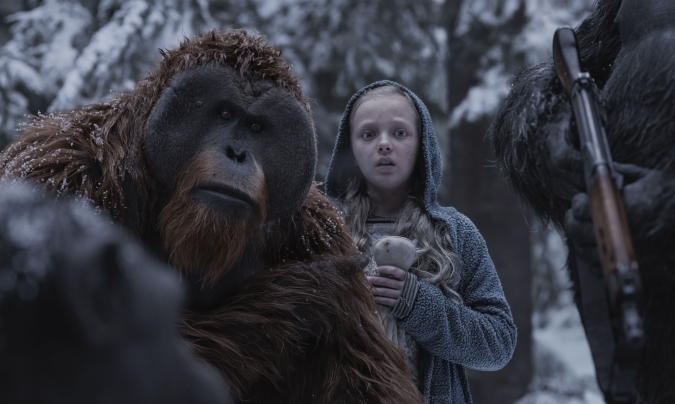 Steve Zahn as "Bad Ape"
Director Matt Reeves caps a trilogy with his best outing yet with War for the Planet of the Apes leaving room for more films. Matt does a great job in pushing your emotions through the spectrum from making you hate your own human race to then pity and more. 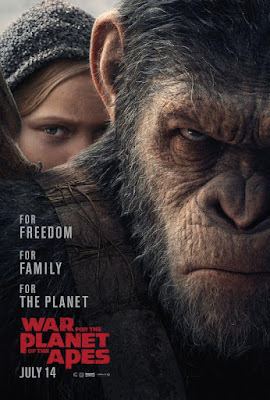 Andy Serkis as the voice of Caesar and Steve Zahn as the comedic relief "Bad Ape," combined with the amazing visuals that combines CGI and motion capture in new ways. In this war the only real winner is the audience. The latest film continues two years after the last film, with Caesar now with his apes in hiding in the woods. Having been out of sight from man, a legend grows out of his existence with the surviving human with some believing he is an urban myth. With the word "War" in the title, it is not long before Caesar's apes and soldiers led by The Colonel played by Woody Harrelson are in full attack mode. Overall, I would recommend watching this film in theaters given the good action scenes. There are some campy moments throughout the film that is a bit of a turn off. However, the film does enough good things including a stellar soundtrack to make you over look it. As a fan of the original series and of this current series thus far, I give this 4 out of 5 bananas.